Following Mystery Science Theater 3000’s successful Kickstarter campaign and subsequent return from The Great TV Beyond, Jonah and the bots are hitting the road. As series creator Joel Hodgson told The A.V. Club, MST3K will bring its movie-riffing act to 29 cities in this summer’s Watch Out For Snakes Tour, with Hodgson serving as emcee. He’ll be joined by cast members Jonah Ray, Baron Vaughn, Hampton Yount, Rebecca Hanson, and “one of the Boneheads”—the facepainted assistants to the mad scientists played by Patton Oswalt and Felicia Day, who’ll appear in the show via pre-recorded videos. 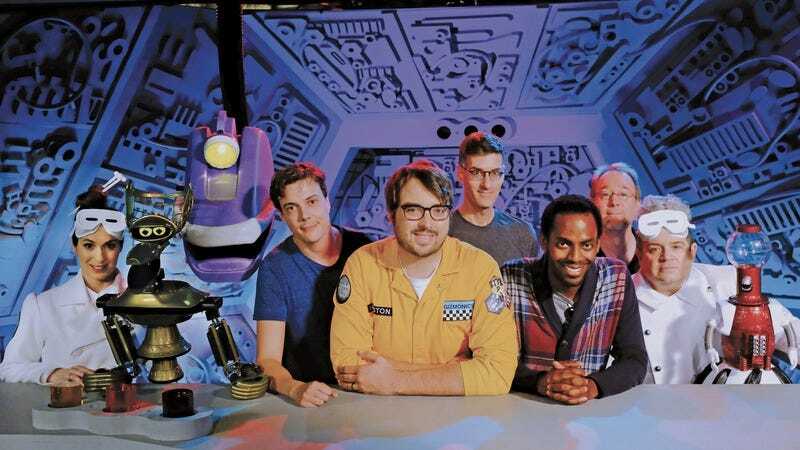 The MST3K team is still waiting to hear from Netflix when/if they’ll get a second season on the streaming platform, but Hodgson says he considers live shows “a kind of spring training” for whatever the future may bering. The tour will present two separate programs (where applicable): One lampooning an unannounced, “super strange sci-fi thriller,” and the other revisiting a fan favorite—and giving the endeavour its name. The Watch Out For Snakes Tour will feature a brand-new riff on Eegah!, the rock ’n’ roll caveman clunker starring Richard Kiel previously seen in one of the final episodes of MST3K hosted by Hodgson. But he hasn’t revisited the show’s original take (“I didn’t want it to color the way we approached it”), a decision that’s providing fresh insight into a movie he last made jokes about more than 20 years ago. “It just shows you that as much as Arch Hall Sr. tried to make a movie that would appeal to everyone, a lot of his own personality seeped into it,” Hodgson said of a film that courted drive-in audiences with guitars, pool parties, dune buggies, gratuitous shaving, and everything else that made up a middle-aged man’s view of youth culture circa 1962. “A caveman is a hippie, after all,” Hodgson joked. The Watch Out For Snakes Tour kicks off July 6 in Boston. The full run of tour dates follows; venue and ticket sales information available here.